Laid back owners and winemakers Alex Krause and John Locke draw on a combined 35 years of making and selling wine in California, Alsace, Publia, Piemonte and beyond. 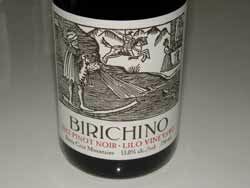 The name of the winery, Birichino, pronounced “biro-kino,” is Italian meaning naughty or mischievous. The winery was originally launched in 2008 to make Malvasia, not a varietal that is well known or in big demand in California. Malvasia is a group of wine grape varieties of ancient origin, most likely originating in Greece. Malvesia Bianca is the most well known of the tribe, and is grown widely in many of the winemaking regions of the world including Italy, the San Joaquin Valley of California, the Greek Islands and Rioja. 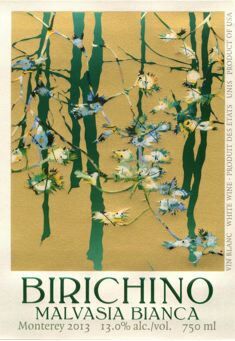 The Birichino Malvasia Biancha is from a limestone and rocky shale site planted with 25-year-old vines on the Santa Lucia Highlands side of Monterey County. The 2013 vintage of this wine is remarkable for its floral expression and is one of the best white wines, bar none, I have drank in the past several years. At $16, it is a crazy value. Birichino recently introduced the 2013 Pétillant Naturel Malvasia Bianca, an old school version of sparkling wine. Pétillants naturels (Pét Nats) are the rage among wine hipster cognoscenti. They are essentially bottle-conditioned wines with the residual carbon dioxide produced by fermentation creating the bubbles, and the richness and texture imparted by the lees remaining a part of the finished wine. No sugar or yeast is added to augment the spritz, instead relying on just those that came in on the grapes from which they are made, and the wine is not disgorged. Each bottle has a variable amount of gentle fizz and amount of residual sweetness as the wines are not adjusted post secondary fermentation. The original pétillant was an 18-bottle lot Alex and John made one afternoon in late 2012 on Alex’s deck from a little Malvasia and actively fermenting Muscat Canelli. The wine was tucked away in the garage and turned out to be delicious. In 2013, the same basic protocol was followed drawing on Malvasia Bianca and a small amount of Muscat Canelli from adjacent 25-year-old blocks in the Santa Lucia Highlands. Each bottle was filled and capped by hand, and because of the increased production a hundredfold, the vintners outgrew the space on their deck and made it at a winery. Soon after the Birichino Winery was launched, the winery’s United Kingdom importer begged for a red wine, and the owners branched out to produce a wine from 104-year-old, own-rooted and dry-farmed Grenache grapes. Then, only days before harvest in 2011, they were offered the chance to work with the 25-year-old Pinot Noir Saint Georges Vineyard owned by the same family that grew the Grenache. The vineyard is located on the eastern side of the Santa Cruz Mountains and is named after the owners, father and son, George Besson, Jr., and Sr., whose families have lived on the property since the 1920s tending the vines. Most of the Pinot Noir had, and still does, go to Calera Wine Company. A second Pinot Noir source subsequently became available. The 4.5-acre, 12-year-old, Lilo Vineyard in the Santa Cruz Mountains is located at a very cool, steep site, planted in slate, sandstone and schist, and sits at the fog line at 600 to 800 feet. Birichino offers wines of character at the right price. Wines offered besides the wines discussed above include: Old Vines Grenache, Old Vines Zinfandel, Old Vines Chenin Blanc, Old Vines Cinsault, Vin Gris, and Muscat Canelli. Visit the website at www.birichino.com for more information and to buy the wines.